A new place to look for birds, at least one I didn’t know about (there are many of those), is highlighted in the Fall edition of the Ruffed Grouse Society magazine. The story is not intended for birders, but for hunters. 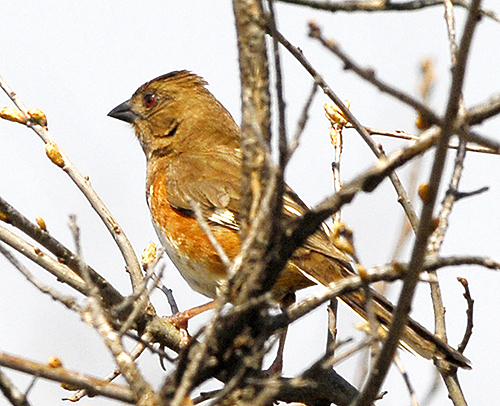 However, this land-restoration project has a lot to do with songbirds. Anyway, work on a 255-acre parcel of land adjacent to Camp Ripley, near Little Falls, has created habitat good not only for grouse and woodcock, but also for songbird species found in young forests. The land is located on the west side of County Road 1 which runs north from Randall and south from Pillager, northwest of Little Falls, in Morrison County. A young forest grows on land that burned or from which timber has been harvested. The progression of regrowth creates a varied and changing habitat that in turn meets the needs of a variety of species. Restoration was a joint project undertaken by the Minnesota National Guard, the Minnesota Department of Natural Resources, the Brainard chapter of the Ruffed Grouse Society, the Minnesota Deer Hunters Association, and the Pillager High School biology department. 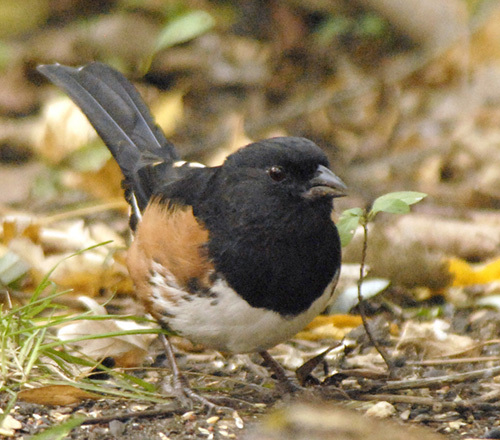 There are species that nest in early-successional forest land, Eastern Towhee, Golden-winged Warbler, and Clay-colored Sparrow, for example. And there are birds that nest in mature forest, then choose younger habit post-nesting to find a better food source. The project includes a variety of habitats. Some timber will be harvested. New trees and shrubs will be planted on grassland and a former gravel pit. Parking areas are marked, and 4.5 miles of trails have been created. Interpretative signs will be included, courtesy of the high school students. Beau Liddell, area wildlife supervisor, told me in a telephone conversation that the three counties under his supervision contain 59 state wildlife areas totaling more than 20,000 acres, all of it significantly under-used by birders. There are trails in most of the areas. Many people worry about being in the woods with hunters, he said, but the best birding seasons, spring and summer, pose no problem. The area Liddell supervises also contains three waterfowl refuges, one state duck refuge, and one state game refuge. The state overall has 1.29 million acres of managed wildlife land, most of it, apparently, rarely used by birders. Search the DNR we site for GPS data and maps, including trail maps. This illustrates why I belong to four hunting organizations even though I stopped hunting decades ago. The duck and pheasant and grouse people put significant amounts of energy and money into creation and maintenance of wildlife habitat. That’s how they spend my membership dues. This is a valuable supplement to the excellent work our DNR does. It the land is good for game birds, it’s also good for songbirds. Conservation doesn’t discriminate.